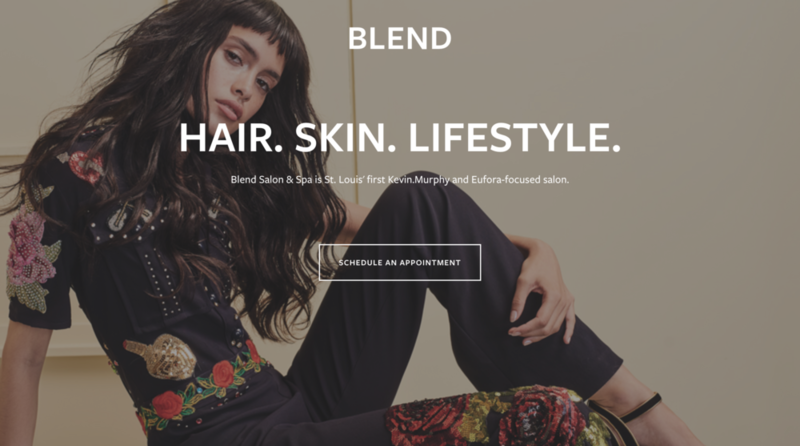 After my work with redesigning the Midtown Alley website on Squarespace and creating a social media presence, TOKY assigned me the client, Blend Salon & Spa. Co-owners and stylists Meghan and Trish wanted to get started on social media and had a specific list of issues with their current Squarespace site. Blend’s biggest issue with their original Squarespace site was the organization. No menu was at the top, and content could only be accessed by scrolling. Clients were not accustomed to opening the mobile menu and were ultimately frustrated with their user experience. Blend already had an existing storefront logo that I referenced when creating a digital logo set for the site and social media. I brought the wood in the exterior signage, the color of interior blue walls, and the unique color of wood-stain floor together in Blend’s new website and social media accounts. After I completed the site, I designed a print and digital spa menu for the new skin offerings. I also taught Meghan and Trish how to use Instagram and Facebook, including features like stories and hashtags. Instagram is especially popular in the salon community to connect with clients and other stylists. I continue to work with Meghan and Trish to keep the site up to date.